The subject of this post says it all! The 99$ promotion is coming to an end on October 15, 2013. We thank all users who purchased GeoTools and CADPower licenses using the promotion prices. If you are still evaluating or have not yet made up your mind, this post is a reminder. Make sure you place your special offer orders on or before October 15, 2013. After this, we revert to the current list prices. We released CADPower V 14.13 update today with two very useful CAD tools. The CP_REPURL command is found in Miscellaneous Tools, under CAD Procedures and is used to edit the URLs (hyperlinks) attached to CAD objects. The search/replace interface of CP_REPURL is similar to the one in CP_ZOOMTXT command and allows case-sensitive, partial and interactive search and replace. Another new command added in V 14.13 of CADPower is CP_TWEAKPOLY. This is a tool to tweak, tweeze or pinch out a vertex from the polyline. The CP_TWEAKPOLY command extracts a new vertex, pulled out from the polyline, unlike grip-editing which allows you to move existing ones. The pictures below will make is clear what this command does. CP_TWEAKPOLY was created as a result of a request from a jewelry design company which uses CADPower as a CAD drafting aid. The tweaked out vertex represents geomtery that was essential for the metal cutting tool to perform its task effectively. 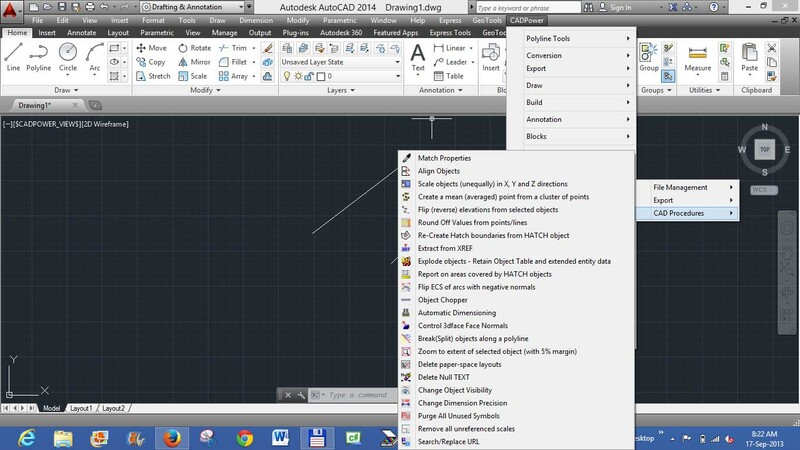 The tool has multi-purpose uses in CAD drafting, and I foresee many CADPower users in the AEC industries finding use for it. The release of BricsCAD V14 is about a month away but here is some heads-up information from Bricsys on licensing mechanism changes in the upcoming version. "BricsCAD V14 will have a new licensing system"
This new system will provide a flexible and modern licensing environment with support for major platforms including Linux, Mac OS X and Windows, as well as 32-bit and 64-bit versions. The new system does not require any change in the type of licenses currently used by BricsCAD but will however cause a one-time break in the use of license keys, with the old keys valid for V13 and earlier versions, and the new keys used for V14 and later versions. After the rollout of V14 in October, customers will not be able to use the standard V14 key they receive to also run V13 or earlier versions. I asked Guy Vancollie about licenses for earlier versions and he said "A V13 (and earlier) key will either automatically be provided together with the V14 one, or will be made available through a web-based self-service system". This is in keeping with the current practice of allowing users use of all pre-current versions of BricsCAD. The new licensing system for BricsCAD is based on technology from Reprise Software. If you would like to pre-educate yourself with the licensing mechanism, you can read more at the Reprise Software website here. The new licensing system allows for up to 2 installs (activation of 2 nodes / machines) with a single license key, which normally translates into a user’s desktop and laptop or home systems: the new system now enforces this limit. A volume key within the new system will be a single key valid for a specific number of installs. A network license will now be a single key valid for a specific number of simultaneous uses, and will furthermore be delivered with a single support contract. Within the Reprise environment network licenses are called floating licenses and have features very similar to Flexera's Flexnet license manager. For Standard or Volume licenses, each end user will need to activate their license online with the licensing server hosted by Bricsys; for Network licenses only the customer-hosted license server needs to activate its license, then an unlimited amount of nodes can connect to the server but it will only allow as many nodes at the same time to run BricsCAD, as the count in its floating license. My take on this - BricsCAD has moved from an open, self-administered licensing method (V13 and earlier) to a managed, cloud-based service where usage is better administered and more importantly, monitored. In other words, the method followed by Bricsys for V14 licensing is in line with contemporary, popular practices for software license management. Last week, a prospective BricsCAD client asked if IGES files could be imported and exported from BricsCAD. The short answer is No. There is no native command in BricsCAD to do this - like IGESIMPORT and IGESEXPORT in AutCAD. The only easy (and freeware) way to accomplish this is via the DXF format using an intermediate freeware software called FreeCAD, an Open Source parametric 3d modeler. There are some limitations though, in using FreeCAD. It can handle 2d and 3d wireframe objects but not 3d solids. You export DXF from BricsCAD, import it into FreeCAD and export it back as IGES files. In the same manner, the IGES file is to be imported into FreeCAD, exported out as DXF and then imported into BricsCAD. Commercial design software like Solidworks, IronCAD, Geomagic Design (Alibre) and others have built-in translators for import/export of IGES data, including solids. If you are looking for something to run with BricsCAD and free of cost, FreeCAD is the option. V 14.12 of GeoTools and CADPower released today fixes a small but significant issue that will help you better manage your toolbars. The problem: Until V 14.11, many GeoTools and CADPower toolbars used same names. This was ok as long as only one software was used. With a growing number of clients who use GeoTools & CADPower together, this was starting to be a problem. It was difficult to identify a toolbar and determine if it belonged to GeoTools or CADPower. To address this issue, a suffix has been at the end of each toolbar name - (CP) or (GT).